1) Aspen condo sales up 31% YTD while inventory of available listings is off -29%. In the 3-mos sales period from Sep-Nov 17, the avg condo/townhome sold at $1,731 sq ft over $1,346 in the same period Nov 2016, +29%.2) Value outside Aspen Core: an example of excellent values away from the Aspen Core, Starwood had (3) sales Sep-Nov 17 at an avg $610 sq ft vs $830 sq ft same period a year ago, -26%. The caveat: these sales were for older homes selling essentially at lot value, but for reference, compare this to the avg. (3) downtown SF home sale at $2,227 sq ft in the same period. New in Current Reports 11/20/17: Where are we now? Chart Series: 2006 – Q3 2017 Historic Pace of Aspen and Snowmass Village Dollar and Unit Sales (updated every quarter). 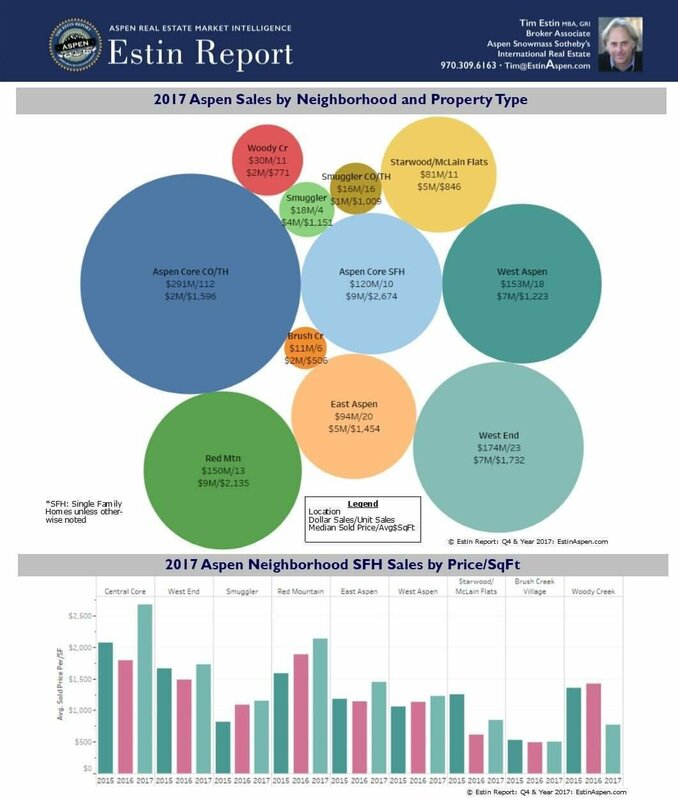 The Estin Report: Nov. 2017 Aspen Snowmass Market Snapshot was posted on Dec 6th in Current Reports.